An artist whose experience as a working cowboy gave him first hand knowledge of western subjects. a nostalgia, so the image can evoke memories of a simple time." 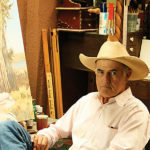 Besides painting and sculpture he has done silk scarves, album covers, furniture, dinnerware, clothing and travel canvas bags, his posters are colorful and can be seen in most western galleries. Buckeye Blake has had a one man retrospect at the Buffalo Bill Historical Society. Monuments include C.M. Russell in Great Falls, Montana and Kit Carson in Carson City, Nevada. Buckeye Blake has also been featured in countless magazines and publications.